Before dashing out the house to head to Biscayne Blvd for a day of cruising, you make sure to brush your teeth thoroughly. After all, you don’t want to run into the paparazzi unprepared to flash your beautiful smile. As you brush and floss you wonder if you’re getting the best results from your manual toothbrush. Could an electric toothbrush work better? You’re not quite sure, but your dentist in Palm Bay has answers for you. There are some very key advantages that the electric toothbrush has over its manual counterpart. Fun to Use – One benefit of the electric toothbrush is that it is fun to use. It allows your inner child to come out and play, as everyone loves the vroom of a motor. Output – That little vroom in the electric toothbrush produces an output of 6,000 – 30,000 strokes per minute. This means that it takes less time to clean your teeth than with a manual toothbrush, which should be attractive to more time-sensitive people. Easy Use – A disadvantage of the manual toothbrush is that it is harder to maneuver with than its electric counterpart. This can be particularly challenging for users who suffer from motor difficulties, arthritis, carpal tunnel, or any other condition that may make manual brushing more challenging. 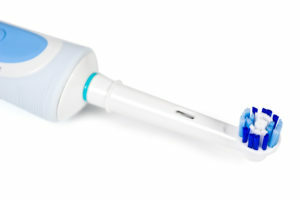 Compensation for Poor Brushing Techniques – The electric toothbrush does an excellent job of compensating for the fact that the majority of the adult population don’t brush their teeth properly, which includes holding the brush at the correct angles, and applying the proper amount of pressure. The electric toothbrush should be used at least twice a day along with flossing to remove harmful bacteria from your gums, mouth and teeth. Also, be sure to change the head on your toothbrush every 3 months to guard against the accumulation harmful of bacteria. You should also consider using mouthwash throughout the day to fortify the benefits of brushing and flossing, as it washes your mouth, removing germs and bacteria. Along with maintaining six-month visits with your dentist for cleanings and examinations, you now have a very solid regimen as a foundation for your dental care. Dr. Marc Mingel is a general cosmetic dentist who received his Bachelor of Science degree in Biology from Cornell University, and his dental degree from Tufts University School of Dental Medicine. He performs a wide range of services including dental fillings, complex implants, cosmetic cases, Invisalign clear braces and veneers. Dr. Mingel practices at Mingel Dental, so if you’re in the Fot Lauderdale area you can tell yourself, “There’s a dentist near me!” He can be reached for more information about his services through his website.